★★★★☆ Actually has a pretty good sound. Well designed for easy carry. I was also VERY surprised to discover the base speaker was PORTED. For those that know what porting is, it shows superior design and performance. Only thing I don't like is you cannot tune the receiver portion without the remote. Would be nice to have 'Function/source', 'Volume', 'Tuning' buttons. As it is now there is only on/off, skip-to-next-song, skip-to-next folder and another button I have yet to discover it's use. I am afraid that if the remote is lost using the unit would become almost impossible. Also, the controls are somewhat hard to understand on the remote. ★★★☆☆ It worked fine except for the USB/SD option which is why i bought it in the first place. No matter how many times I push the "Input" button, the USB/SD never shows up on the screen. Other than that, i am happy with the Unit. If you would install a rechargeable, or alkaline battery feature, making it truly portable, it would really be a great item. Even though the USB/SD never shows on the screen, I did however figure out how to play my Flash drives by turning off the machine, inserting the USB and then turning it on again. It then will play the selections i have on the Thumb drive including the individual folders. I have not been able to make the SD work however. But i only tried two of them so it was not a good test. 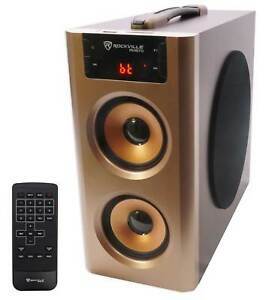 ★★★★★ This speaker system works as advertised. It has good bass response while carrying good highs and mids as long as you don't crank the volume all the way up. The built in radio is cool as well as the Bluetooth connectivity and I like having the option of RCA input connections as well as 3.5 millimeter speaker connection and usb+SD card input. The remote makes it easy to change stations, inputs or volume setting without walking over to the speaker The whole thing is smaller than the pictures makes it out to be but it is well worth a 35 dollar price tag. I have a multifunction Victrola record player that needed some help with bass and this is the perfect device to add that missing touch without taking up huge space. ★★★★★ This is the best $35 I've spent in a while. I'm into hi-end audio, but recognize the need and place for portable options such as this little home theater option. It spends most time hooked to my kitchen tv. Also, I take it on vacation and hook it to flat screen tv's to get away from the torture of tinny tv sound and this thing fits that purpose perfectly. Using the supplied 3.5mm plug to RCA plug for inputting the tv signal is very easy and simple. Also, I stream Tidal Hifi and you tube content via bluetooth from various laptop computers, so I never run short of music choices and the sound is quite acceptable. No issues with bluetooth connectivity. No more hauling multiple pieces of equipment on trips. Although I don't typically use the fm radio, it sounds good as well (I like to stream radio content via computer to avoid terrible radio markets). It fills a medium sized room with adequate sound and unless you're after widow rattling rock, it's fine. The sound is clean and the bass is nimble and present, especially for a 4" driver. As you can tell, I love this little guy for providing good sound options where portability and small size is needed. A stupid good buy for sure. The only thing I wish for is a carrying case, I now use the box it came in. ★★★☆☆ Nice speaker, well built, functional and nice retro look. Buttons on the unit takes a little to get used of (multifunctional buttons) really love the built and looks of this piece. Unfortunately it doesn't sound as good as it's looks. It does sound decent, loud enough and if u put it in a corner you will get a fair bass response. , but don't expect Hi-Fi sound, loud bass, superclear mids, sharp high or a high volume (it give out probably about 5watts at most at its loudest) however not a lot of distortion, which is a good thing. Also FM reception is very good. Do I recommend this speaker? for the money, absolutely YES. it will look great next to the computer and it will give out very good sound especially if it seat near you. U can get two of these, buy a left and right Y splitter cable and have them in stereo. I might just do that. Love it!!!!! !